The objective of the study presented in this report was to document the launch of the Iowa River Bridge and to monitor and evaluate the structural performance of the bridge superstructure and substructure during the launch. 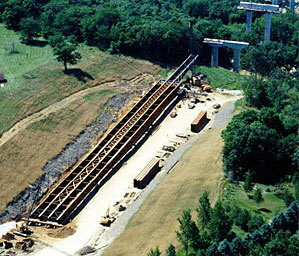 The Iowa Department of Transportation used an incremental launching method, which is relatively unique for steel I-girder bridges, to construct the Iowa River Bridge over an environmentally sensitive river valley in central Iowa. The bridge was designed as two separate roadways consisting of four steel plate girders each that are approximately 11 ft deep and span approximately 301 ft each over five spans. The concrete bridge deck was not placed until after both roadways had been launched. One of the most significant monitoring and evaluation observations related to the superstructure was that the bottom flange (and associated web region) was subjected to extremely large stresses during the crossing of launch rollers. Regarding the substructure performance, the column stresses did not exceed reasonable design limits during the daylong launches. The scope of the study did not allow adequate quantification of the measured applied launch forces at the piers. Future proposed research should provide an opportunity to address this. The overall experimental performance of the bridge during the launch was compared with the predicted design performance. In general, the substructure design, girder contact stress, and total launching force assumptions correlated well with the experimental results. The design assumptions for total axial force in crossframe members, on the other hand, differed from the experimental results by as much as 300%. A 32-minute video of the Iowa River bridge construction process is available. Order a free DVD by contacting Max Grogg, programs engineer, FHWA, Iowa Division, 515-233-7306, max.grogg@fhwa.dot.gov. Or write to him at 105 Sixth Street, Ames, IA 50010. Or borrow it from the LTAP library by contacting Jim Hogan, CTRE’s library coordinator, 515-294-9481, hoganj@iastate.edu. Launching pit with partial girder assembly in place.